Haven't checked this thread for a while, its looking great, I want to fly them all. Loki (Duress) in the Nebula and Scimitar in the asteroids images looks the most visually striking to me. What programs did you use to compose it? or is it straight out the render package? Having made thousands of ships for games myself, I admire your modelling skills and the detail in your work. Very tidy/even UV layouts! I wish we had the same available texture sizes back in my day. I will keep watching you post. Great to see, all the best. These are great. I especially love the Crossbow renders, which I found while searching for info on it. Next up: a broadsword for Deathsnake and a variant of the Shrike. I have a question about the Shrike's gun mounts. The database says it has 2 particle, 3 mass drivers and a stormfire mk2. First didn't it have charging mass drivers? Not that it's really that important for me. The big question is... where the heck do the three mass drivers go? The wingtips have recesses for 4 slots (two on each side) This works good for the 2 particle cannons, but the three mass??? There's nothing down the center of the ship for a third, plus you have that stormfire. That can be placed between the hull and that extension on the bottom. The odd number works for the broadsword (left,center,right) but here it's a problem. Also look at the shrike pictures on the main site, it shows four gun barrels. Perhaps 2 particle and 2 mass drivers???? Ya two for the particle guns, 2 for the mass drivers... that leaves just one. 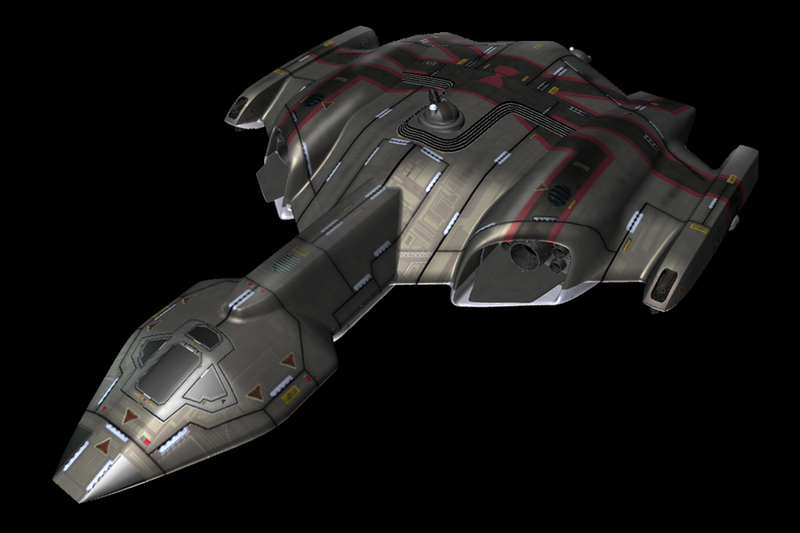 If this was a kilrathi ship, then an asymmetric odd number gun mounts would make sense, but its not. Really weird. A few personally liberties, it's definitely a two-seater now (most bombers should be anyways), one of the mass drivers was dropped. The tweaker in me wants to scrap the mass drivers for a Cloudburst or Dust Cannon. The Secret Ops weapon loadout was fun, but I liked the Charging Mass Drivers--one fully-charged blast could obliterate anything lighter than a Moray in one hit, and anything up to a Manta in two. Really digging the corvettes! Nice work! 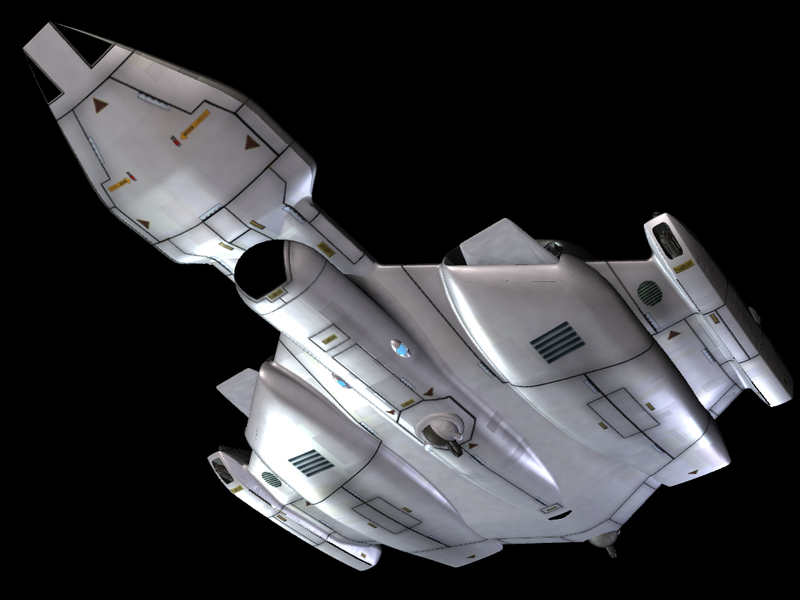 Weird, I named the seagull after the prophecy seahawk quite a few years ago (the old venture/swacs model). As I updated the seagull, I thought it would be good to have two different variants using the same basic hull design. "Seahawk" just seemed to fit the more combat role, a more predator bird name. Seahawk just seem to fit, perhaps subconscious remembering the name.. dunno. Hey, it looks like your photobucket pictures are no longer working. Can you repost your Shrike on the forums or another service? Ya I maxed out my bandwidth at photobucket. Seriously 10gb a month So basically I need to start looking for more useable options. I can recommend imageshack. I've been using this service for years and I never had any problems with it. Question about the saratoga, what are those 2 ports for on the bottom of the carrier for? Secondary launch tubes? For ship recovery? Torp launcher? Air Con intake? Nice! So I'm curious, how are you making the textures for these things? They're obviously bespoke for each one, but there's common elements among all of them - do you just have a library of things you pull from in Photoshop? about how long does it take to make a texture from scratch?